Well known for competing in Tactical Precision Rifle Shooting competitions, Gilliland tried her hand at competitive shooting in 2012 with husband 1SG, former ranger and record-holding Army Sniper, Jim Gilliland at the PTS Team match in Cookeville, Tennessee. 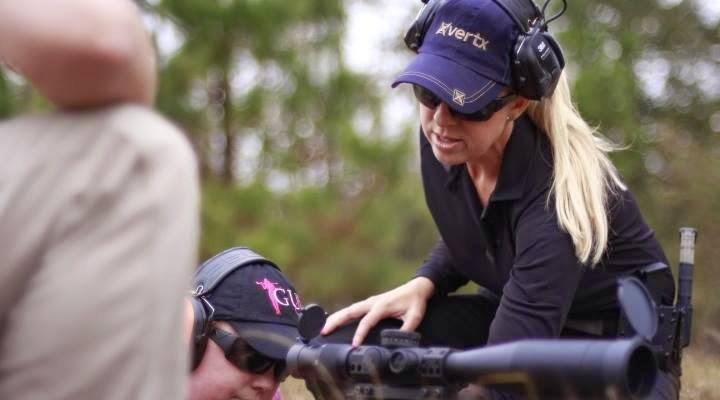 In the past two years, The Second Amendment advocate, mother of four children and U.S. Military supporter has made quite the name for herself, having acquired over 245,000 Facebook likes by top shooting industry professionals. Never one to slow down, Gilliland also works closely in the firearms industry, working as a contributing writer for Personal and Family Defense Centers on America, BreachBangClear.com, SureShots Magazine, and most recently Gunsamerica.com. "Vertx has the most comfortable tactical clothes on the market. I have worn other brands in the past at my competitions and Vertx has the best female fit,” said Gilliland. They are designed for the female body so the fit is perfect and comfortable." Although well known for her competitive rifle shooting capabilities, Gilliland’s other achievements include co-hosting Seasons 3 and 4 of Trigger Time TV and co-owning Shadow 6 Consulting with her husband Jim. Gilliland is also a proud supporter of www.AmericanSnipers.com, where she has modeled professionally in Tactical Girls calendars for over 3 years to help support and sponsor snipers across the Country. Gilliland plans expanding her match schedule to include national tactical rifle competitions through the US throughout 2014, and although admitting to being one of the few women competitors who regularly competes at competitive rifle competitions, she is never one to shy away from fear.